Because of the heat, my focus is on fresh, no-cook food that is making the most of the season! And today I have a beautiful simple salad for you that will totally blow your socks off. The colors, the textures and the bright, fresh flavors are over the top- but still, I am telling you- SO SIMPLE. That also means easy. My favorite. 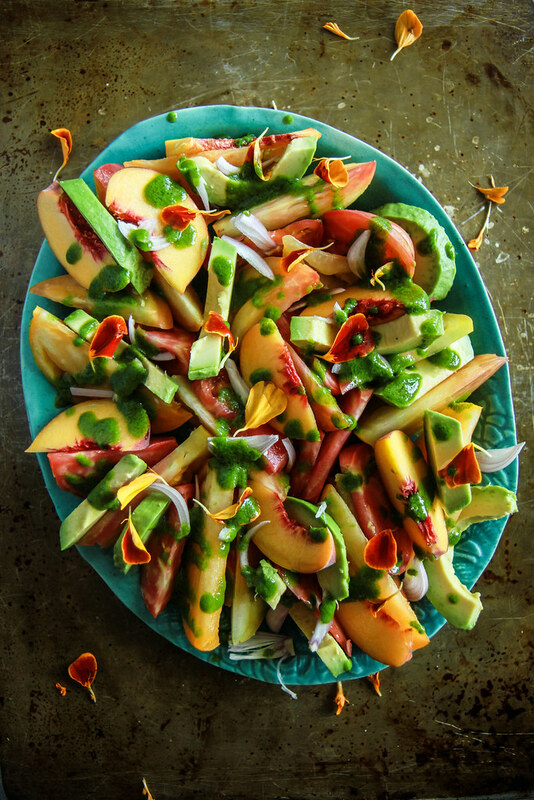 This is truly a celebration of Summer’s best: juicy stone fruit and flavorful heirloom tomatoes- also ripe firm avocado and a drizzle of zesty bright green cilantro vinaigrette. This whole recipe takes no more than a few minutes to pull together and its JUST SO PRETTY!! Also, it can be a lovely lunch on it’s own or is absolutely delicious served with grilled fish, chicken or steak- the perfect side dish. 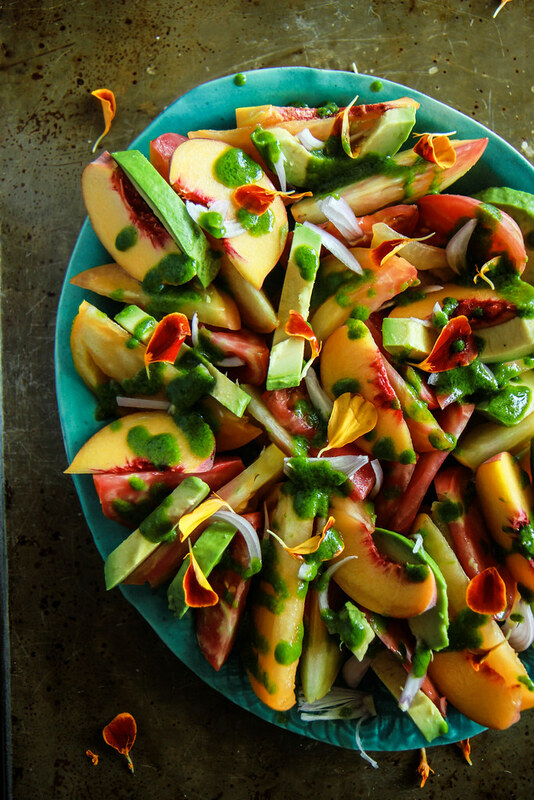 Arrange the tomato, peach and avocado wedges and sprinkle with the thinly shaved shallots and drizzle with a few tablespoons of the cilantro vinaigrette. Serve chilled or at room temperature. Such a stunner, I love the cilantro vinaigrette! Looks fabulous! Does the vinaigrette get pulsed in a food processor? This is one gorgeous salad! Loving all the summer favorites! This salad screams summer and I could eat the whole bowl! So exciting that you will be on the TODAY show! Loving this fresh summer salad! Yay! I’ll be watching! Love the ingredients in yet another gorgeous looking salad! These colors and flavors! So happy! 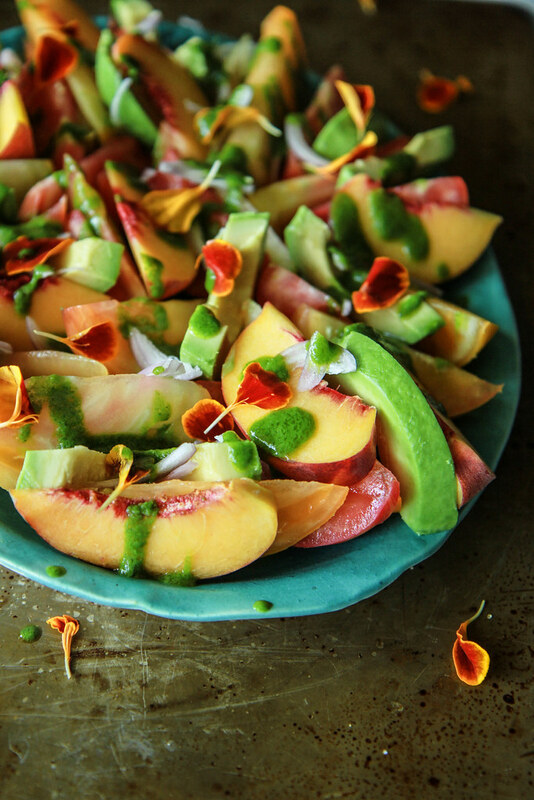 I’m OBSESSED with this peach-avocado combo! YUM! This would be great too with Prosciutto if not vegan!! Making for lake weekend! This is a great recipe for hot days, I will do it right next morning! Heather Christo – you are amazing! Thank you for sharing your delicious beautiful recipes! You are right – the tomato and peach goes exceptional together! I added fresh mint and basil to mine and it was divine!